Living life as passing ships in the night wasn’t working for Derek and Stephanie Lombard. Derek worked in corrections and Stephanie worked for Mercy Hospital on opposite shifts until 2010, when the pair opened Above & Beyond Cleaning. The company cleans for commercial businesses in locations from Waterboro and Lewiston to Freeport and Portland. “Why work for the man, if you can work for yourself,” Derek said. 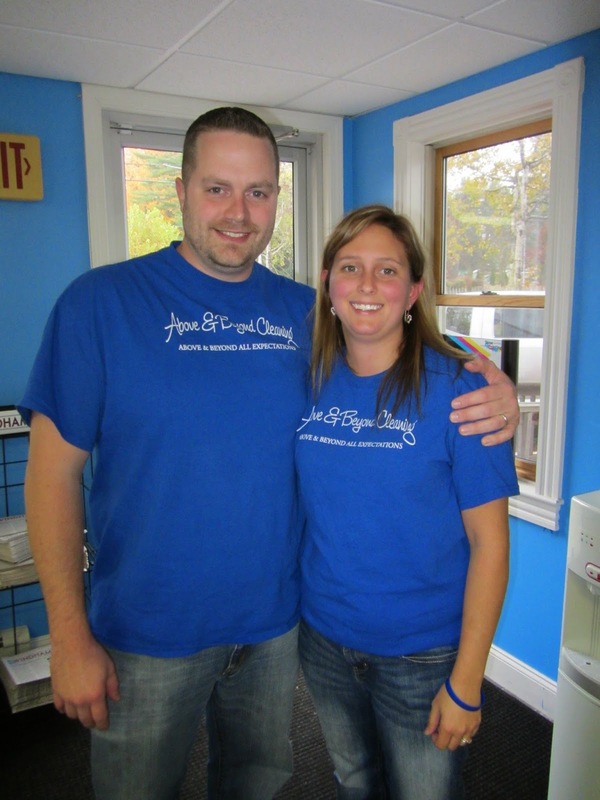 He started cleaning at night at the Gorham Savings Bank in Waterboro and built the business so that Stephanie could leave her job and work with him. The company does carpet cleaning, window cleaning, BCT waxing and other janitorial services. All of the work is done behind the scenes at night. “When we come in you don’t have to worry. When we come in nobody’s going to see us,” Stephanie said. They use products familiar to clients, like Simple Green, Windex and Eco-lab for floors. If customers need special products, the company would meet those needs too. “We do everything from a 500 square foot building up to a 14-story building in downtown Portland,” Stephanie said. “And everything in between,” Derek finished. Above & Beyond Cleaning does bids for jobs differently than most cleaning companies. They work up a customized cleaning plan and timing needs, and instead of basing the job on square footage, they base it on the job. “We work with each client on an individual basis,” Stephanie said. “We clean them,” Derek finished. As bosses, the Lombards are involved in what their nine member staff is doing every day. “We do quality checks to check that our standards are being adhered to,” Stephanie said. “We like to think our name says it all,” she added. All of the employees are trained in attention to detail, are reliable and have criminal background checks. The company has a goal of managing and growing its accounts from 15 to many. “We’re a part of their presentation to their customers every day. It’s rewarding,” Stephanie said. Above & Beyond Cleaning would like to work with more banks and credit unions who are consistent in the cleaning they are looking for and Above & Beyond Cleaning would like to grow with them as they expand. “We’re looking forward to providing you a cleaner future,” Derek concluded.